The United States Court of Appeals for the District of Columbia Circuit (in case citations, D.C. Cir.) known informally as the D.C. Circuit, is the federal appellate court for the U.S. District Court for the District of Columbia. Appeals from the D.C. Circuit, as with all U.S. Courts of Appeals, are heard on a discretionary basis by the Supreme Court. 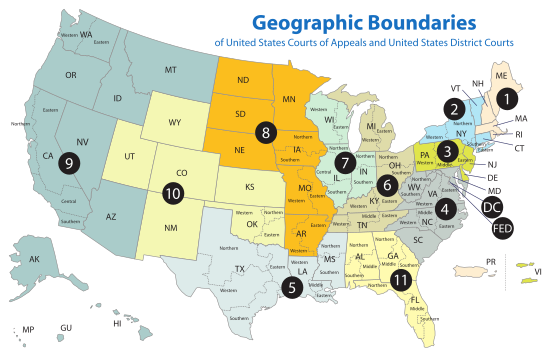 It should not be confused with the United States Court of Appeals for the Federal Circuit, which is limited in jurisdiction by subject matter rather than geography, or with the District of Columbia Court of Appeals, which is roughly equivalent to a state supreme court in the District of Columbia, and was established in 1970 to relieve the D.C. Circuit from having to take appeals from the local D.C. trial court. A judgeship on the D.C. Circuit is often thought of as a stepping-stone for appointment to the Supreme Court. As of October 2018 [update], four of the nine justices on the Supreme Court are alumni of the D.C. Circuit: Chief Justice John Roberts and Associate Justices Clarence Thomas, Ruth Bader Ginsburg, and Brett Kavanaugh. Associate Justice Elena Kagan was nominated by President Bill Clinton to the same seat that Roberts would later fill, but was never given a vote in the Senate. In addition, Chief Justices Fred M. Vinson and Warren Burger, as well as Associate Justices Wiley Blount Rutledge and Antonin Scalia, served on the D.C. Circuit before their elevations to the Supreme Court. In 1987, President Ronald Reagan put forth two failed nominees from the D.C. Circuit: former Judge Robert Bork, who was rejected by the Senate, and former (2001–2008) Chief Judge Douglas H. Ginsburg (no relation to Ruth Bader Ginsburg), who withdrew his nomination after it became known that he had used marijuana as a college student and professor in the 1960s and 1970s. Likewise, in 2016 President Barack Obama nominated Merrick Garland from the D.C. Circuit to replace the late Scalia, but the Senate controversially did not give Garland a full vote. The United States Court of Appeals for the District of Columbia Circuit meets at the E. Barrett Prettyman United States Courthouse, near Judiciary Square in downtown Washington, D.C.
From 1984 to 2009, there were twelve seats on the D.C. Circuit. One of those seats was eliminated by the Court Security Improvement Act of 2007 on January 7, 2008, with immediate effect, leaving the number of authorized judgeships at eleven. (The eliminated judgeship was assigned to the Ninth Circuit effective January 21, 2009). When Congress established this court in 1893 as the Court of Appeals of the District of Columbia, it had a Chief Justice, and the other judges were called Associate Justices, which was similar to the structure of the Supreme Court. The Chief Justiceship was a separate seat: the President would appoint the Chief Justice, and that person would stay Chief Justice until he left the court. On June 25, 1948, 62 Stat. 869 and 62 Stat. 985 became law. These acts made the Chief Justice a Chief Judge. In 1954, another law, 68 Stat. 1245, clarified what was implicit in those laws: that the Chief Judgeship was not a mere renaming of the position but a change in its status that made it the same as the Chief Judge of other inferior courts. The court has eleven seats for active judges after the elimination of seat seven under the Court Security Improvement Act of 2007. The seat that was originally the Chief Justiceship is numbered as Seat 1; the other seats are numbered in order of their creation. If seats were established simultaneously, they are numbered in the order in which they were filled. Judges who retire into senior status remain on the bench but leave their seat vacant. That seat is filled by the next circuit judge appointed by the President. ^ John Roberts (2006). "What Makes the D.C. Circuit Different? A Historical View" (PDF). Virginia Law Review. 92: 375. Archived from the original (PDF) on February 25, 2012. ^ Hearn, Ted (September 4, 2008). "Comcast Sues FCC Over Network Management Finding: Cabler Wants Agency's Decision on Its P2P Policies Reversed". Multichannel News. ^ "Judicial Decisions | Law Library of Congress". loc.gov. Library of Congress. 2014-12-31. Retrieved 2015-11-18. ^ a b c Prior to 1948, the court consisted of a Chief Justice and up to five Associate Justices. Much like with the Supreme Court of the United States, the Chief Justice would be separately nominated and subject to a separate confirmation process, regardless of whether or not he was elevated from an associate justice position. In 1948, the positions of Chief Justice and Associate Justice were reassigned to Circuit Judge positions and the position of Chief Judge was assigned based on seniority. ^ a b c d e f g Recess appointment, confirmed by the Senate at a later date. "Standard Search". Federal Law Clerk Information System. Archived from the original on 2005-10-21. Retrieved 2005-06-02. "Instructions for Judicial Directory". Website of the University of Texas Law School. Archived from the original on 2005-11-11. Retrieved 2005-07-04. 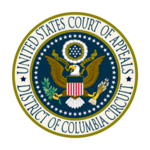 "U. S. Court of Appeals for the District of Columbia Circuit". Official website of the Federal Judicial Center. Archived from the original on 2005-04-04. Retrieved 2005-05-26. What Makes the DC Circuit so Different? A Historical View - Article by Chief Justice John G. Roberts, Jr.